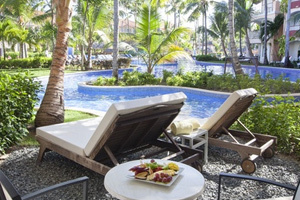 Majestic Elegance Punta Cana’s 597 rooms are furnished with quality materials such as European marble and have many facilities as double Jetted Tubs, elegant amenities and numerous personalized services. 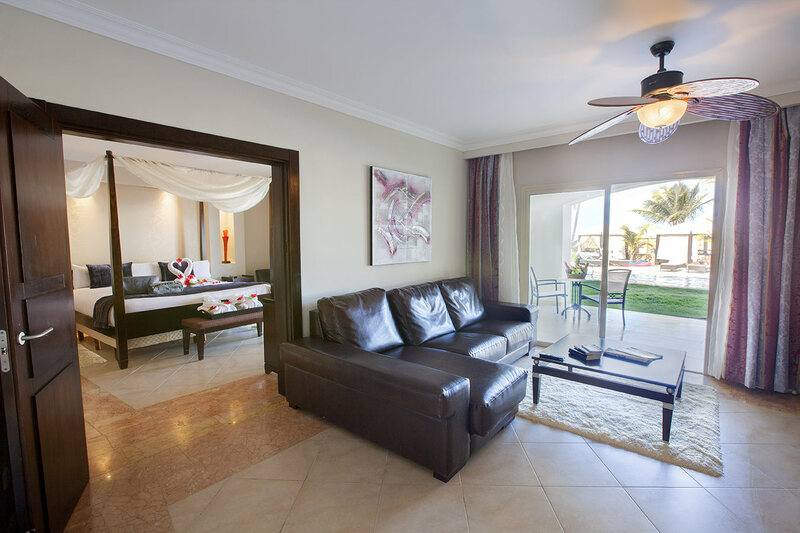 All rooms are located in two completely different sections: on one side, the Main Section, aimed at families, couples and groups; on the other side, the Elegance Club, an exclusively adult only residence for over 18 year olds. In both sections, guests can choose between different room categories, depending on your tastes, expectations and requirements. 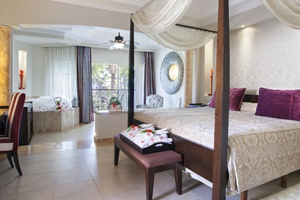 For convenience, in the main section of Majestic Elegance we have handicap accessible rooms and connecting rooms in the Junior Suite with Jetted Tub, both upon request and subject to availability. The spacious and comfortable Junior Suites with Jetted Tub have an area of 50 square meters (532 square feet) as well as an indoor Jetted Tub for two. 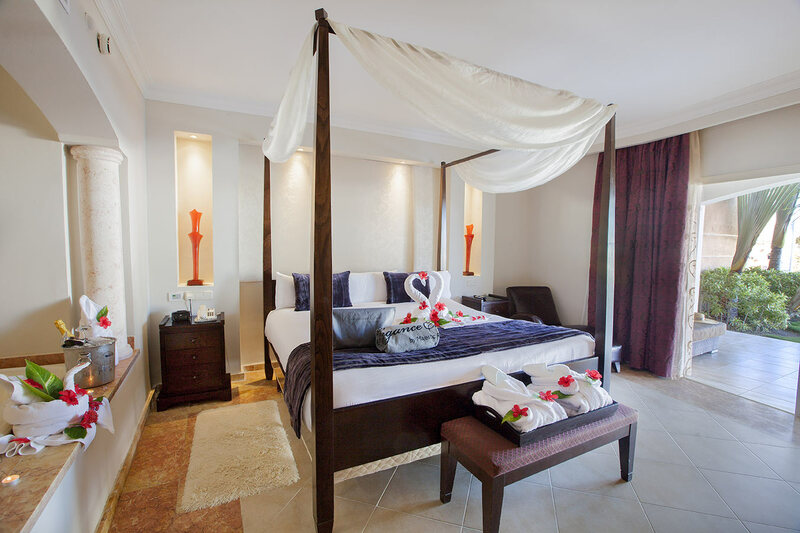 Located on all floors of the hotel and equipped with a King size or two full size beds, they have a maximum occupancy of 4 people (2 adults and 2 children or 3 adults and 1 child). All Majestic Junior Suite (Swim Up) are located on ground floor and come with King size or two full size beds, indoor Jetted Tub for two and direct access to the pool and private garden. Its 50 square meters (532 square feet) can accommodate up to 4 people (2 adults and 2 children or 3 adults and 1 child). 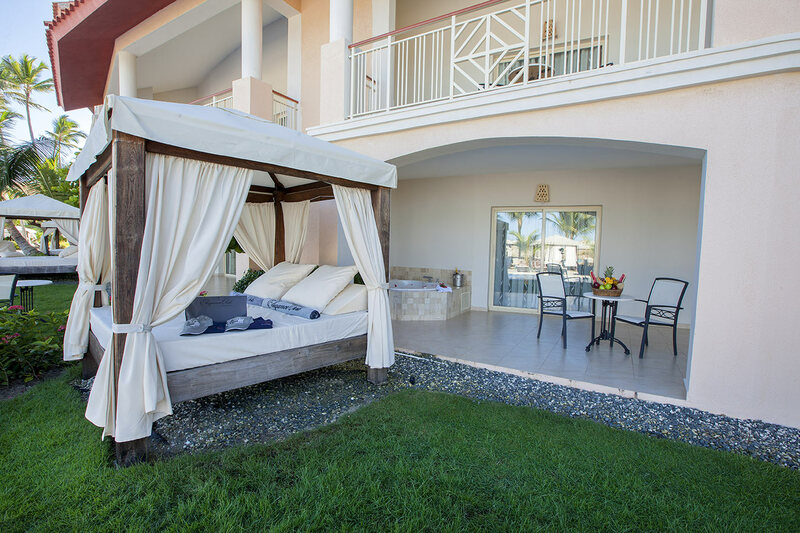 All Colonial Junior Suites (Outdoor Jetted Tub) are located on the fourth floor and have two Jetted Tubs, one indoor and one outdoor on the private terrace. With 50 square meters (532 square feet) come with a King size bed and can accommodate up to 4 people (2 adults and 2 children or 3 adults and 1 child). 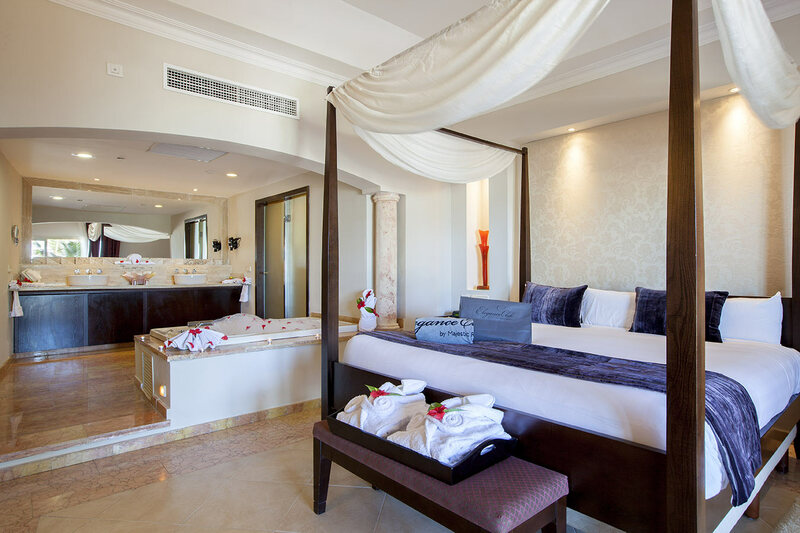 Located in all floors of the Adults Only section, the Elegance Club Junior Suite with Jetted Tub has an area of 50 square meters (532 square feet), a king size bed or two full size beds and overlooks the pool or garden. They can accommodate up to 2 adults. Located on ground floor of the Adults Only section, the Elegance Club Majestic Junior Suite (Swim Up) are 50 square meters (532 square feet) and have an indoor Jetted Tub, direct access to the pool and private garden area. 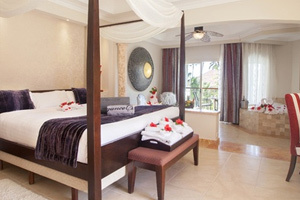 They come with a king size bed or two full size beds and can accommodate 2 adults. 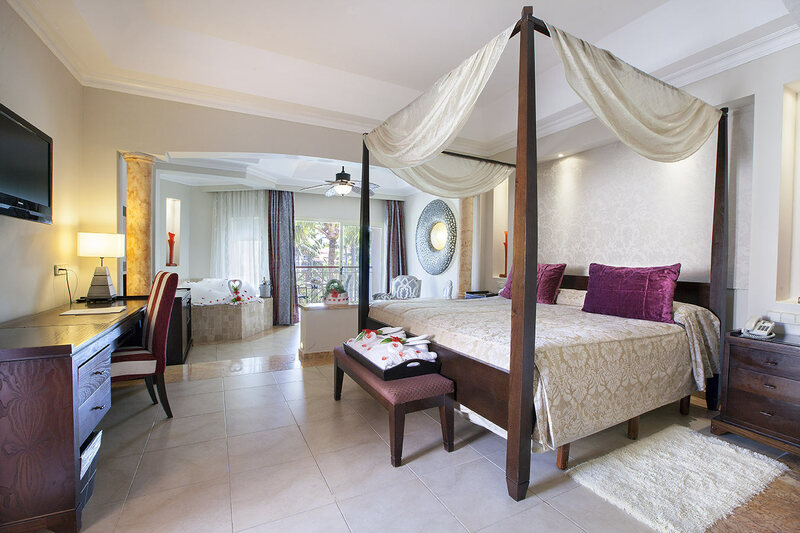 The Elegance Club One Bedroom Suite with Jetted Tub is located on the first, second or third floors of the Adults Only section, comes with a king size bed and has an area of 100 square meters (1064 square feet), with living room and bedroom area separated by sliding doors. It can accommodate up to 4 adults. 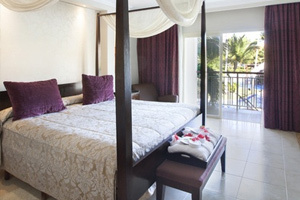 Located on the second and third floor of the Adults Only section, the Elegance Club Ocean View Suites (Outdoor Jetted Tub) have an area of 100 square meters (1064 square feet), an independent bedroom, with a king size bed and walk in closet, separated from the living room by sliding doors and two Jetted Tubs (one indoor and one outdoor). 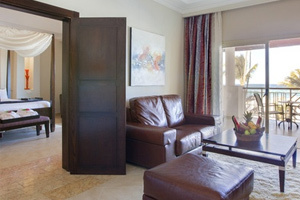 With spectacular Ocean view, they can accommodate up to 4 adults.